Sometimes it isn't easy being a defender of Margaret Atwood. Not that she needs defenders; she is, after all, one of the world's greatest novelists, not to mention a poet, essayist, and inventor of ingenious machines. Still, for some reason, her very existence is an affront to some within the science fiction community and it is hard to view this as being anything other than a reaction to the fact she is an outsider. The beleaguered island of fandom has a tendency to act like the British Isles during the Second World War; huddled together, aggressive and suspicious of foreigners—loose lips sink ships—but about as easy to take seriously as Dad's Army. Some of us, however, were able to see past the latest meaningless tangle over what was speculative and what was scientific to the work itself. And we saw that it was good. Atwood has now repaid this faith by producing a very rum book indeed. When rumours first surfaced that Atwood was writing a sequel to Oryx and Crake called God's Gardeners it seemed a rather unlikely prospect. Once you have overseen the end of the world, where else is there to go? Cormac McCarthy was hardly likely to write a sequel to The Road , was he? As it turned out, The Year of the Flood (as it soon became clear was the real title) is not a sequel, it is—even more puzzlingly—a retread. In a way this is not entirely surprising; if you are writing about the end of the world it usually stems from some anxiety about the state of the world now and if you were anxious about the world in 2003 you are probably still going to be worried. At the same time, though: why? Wrongness is no excuse for repetition. Similar concerns underlie all Atwood's novels—fantastic and mimetic—but Oryx and Crake wasn't simply The Handmaid's Tale told from the perspective of another character. The idea just seems weird but make no mistake, this is exactly the route The Year of the Flood takes. Oryx and Crake follows the life of Jimmy from his childhood in a corporate enclave where he befriends Glenn (later Crake) to college and then the disappointments of adulthood before ending as (so he believes) the last man on Earth, spared from the plague that Crake has unleashed. The Year of the Flood rewinds the clock to replace the male perspective of Jimmy and Glenn with the female perspective of Toby and Ren. Just as previously with Jimmy, the book opens with Toby, alone, surrounded by the ruins of civilisation before quickly moving backwards to the time before. Toby's family are doing fine, living an old-fashioned life on the edge of the city. Her mom sells health supplements in the mall and has a vegetable garden, her dad sells air conditioning and takes her hunting. Then her mom gets sick. The bills stack up, they sell the house, she doesn't get better, he loses his job, they go bankrupt, she dies, he commits suicide. It is a typical dystopian narrative. Except, of course, it is not. This is not the future, it is the United States of America in 2009 where millions of people do not have access to healthcare and medical expenses are a major reason for bankruptcy. A dystopian flourish is added by a realisation of that most American fear, the confiscation of private firearms, but this is less If Things Go On than a quiet, but pointed, reminder of the way things are. 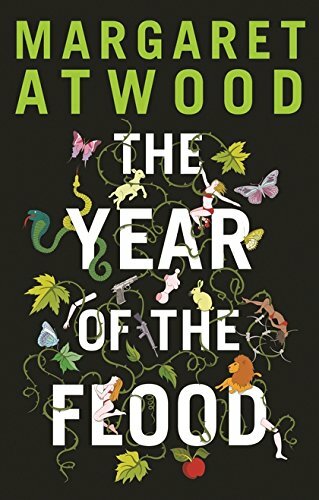 So it at first seems that The Year of the Flood is to be social commentary of the sort we might expect from a Canadian feminist now into her eighth decade. That's a good thing, by the way, but unfortunately it is not to be because this finishes on page 29. From the next page we are exposed to Atwood's worldbuilding in all its awesome weakness. Chapter 7 opens with the line: "The period that followed was a bad time for Toby." This is typical understatement. After covering up her father's firearm suicide, she drops out of college and then drops off the radar in order to avoid any of his debts. She moves to a shithole called Willow Acres but nicknamed Sewage Lagoon. To make some money she sells her eggs to a fertility clinic but the procedure is botched and she is rendered unable to conceive. She then gets a job at SecretBurger (a Mafia front) which both pays and provides free food, albeit of unidentified origin. Unfortunately, the other perk it comes with is being repeatedly raped by her boss—"He demanded her services during her lunch break—the whole half hour—which meant she got no lunch" (p. 39)—who promises to kill her if she quits her job. Which she can't afford to do anyway. Here we have moved definitively from pseudo-dystopia to unequivocal nightmare, but we are constantly distracted from the horror of this nightmare by its dream-like insistence on geographical incongruity and bloody silly set-dressing. Sewage Lagoon is supposed to be the very bottom rung of civilisation, but below Toby's flat is "an endangered-species luxury couture called Slink," the by-products of which, we are told, "were sold on to a chain of gourmet restaurants called Rarity" (pp. 30-31). Does this make any sense? The distance between the elite and the huddled masses is much too small, the physical and economic barriers nowhere near mountainous enough. It is much as if Atwood has upended all her ideas onto the page and left them bunched together there. This animal trade, incidently, is illegal—there are heavy fines for it—whereas on the same page we are told that deathsquads for illegal immigrants are absolutely fine. Perhaps this is one area where Atwood's satire hits home—the ruling classes have always been more interested in animals than people—or perhaps it is simply indicative of Atwood's casual approach to the construction of her future. And, alas, although Atwood has now started in on the puns, she is unfortunately only warming up and has many more to come. Futuristic gladiatorial games in fiction are ten a penny, so on one level this is simply unoriginal. It is also, in a novel of otherwise unremitting pessimism and wry cynicism, a blush of childlike naivete. No one gives enemies of the state a roll of the dice; they get a bullet in the back of the head (if they are lucky). This is particularly true when the state has ceased to exist, when polite fictions like rendition are utterly obsolete. And since the state has withered and the population has been abandoned to the tender mercies of the market, the idea of this Russian roulette as a form of mass televised entertainment is equally unlikely. When you have a spraygun in one hand and the reins of capitalism in the other, you don't need bread and circuses. Nor is it clear why the powers that be would be interested in non-political criminals. The justification here is that Blanco killed a Corp woman who was slumming it out in the real world and hence went too far, but this doesn't seem a strong enough motive, particularly since they are making a rod for their own back: "Even the CorpSeCorp professionals were scared of the long-term Painballers" (p. 98). Frankie says arm the unemployed. Because, unbelievably, this is a level playing field. Do your time and survive and you are home free. This is perhaps Atwood's only contribution to originality because it is axiomatic to SF blood sports that there is no escape. Everybody knows that the dice are loaded, everybody knows that the fight was fixed. Everyone except, it would appear, Atwood. Now, none of this is the point of the novel and it would be nice to pass swiftly over it. It clogs in the throat, though; you need to give yourself a couple of sharp thumps on the back before proceeding with the book. If not an impossible impediment it certainly puts you off. It is a line that both sounds good and sounds true. This is what gets us over the hairballs of Bimplants and Painball but it is unlikely to be enough to sustain the reader over a novel this length. To get to this stage of the review we have already gone through a lot of synopsis for not much plot, but then Atwood is much less interested in plot than she is in journey. The problem is that it is a very well trodden journey; in many ways Ren retreads Toby's journey, but even more precisely she follows in Jimmy's footsteps. They come from the same background, they meet at college and become lovers, they survive both the aftermath of college and the end of the world. Once Ren's narrative joins up with Toby's at the Gardeners' refuge, the rest of the novel simply shadows Oryx and Crake at one step removed. It is hard not to love Atwood for the glint in her eye when she writes lines like that. This humour (which has no satirical intent) stands in contrast to the early satire (which is not funny). It is maddening, as is the book as a whole. 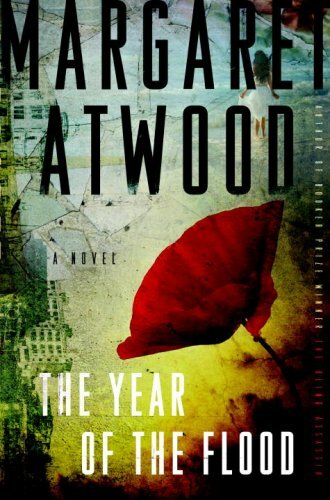 As I've already said, The Year of the Flood sees Atwood returning to Oryx and Crake like a dog returning to its vomit. It is not surprising then than the finished product resembles a dog's dinner. On every page you are likely to find evidence of a great writer, but that doesn't change the fact that Atwood has written a bad book and she should feel bad. If Atwood is not pulling her weight then Liz Jensen—an admirer of Atwood and Oryx and Crake —is punching above hers, at least in terms of expectations. 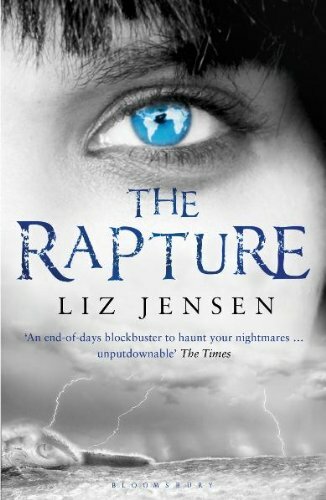 The Rapture is also published by Bloomsbury but its presentation indicates something of a prestige gap. Atwood's book is lavishly designed with an embossed cover and even a jaunty lime green cloth bookmark. (How appropriate this is for the contents of the novel is another question but it is certainly impressive.) Jensen, by contrast, gets a standard Photoshop mishmash of generic images (a woman's face, the moon, a wave) from the photo library. If Bloomsbury are shouting the patronage of Atwood from the rooftops they are sneaking Jensen out in perfect bookshop camouflage, ready to slip quietly into the midst of the midlist. Thankfully quality does have a tendency to shine through and Jensen has received the reviews she deserves. As is often the way in books, her previous therapist has mysteriously left under a cloud but, since her introduction to electroconvulsive therapy, Krall is showing signs of progress. These improvements come with interesting side effects. Fox quickly becomes fascinated by the art that Krall is producing in her therapy sessions (in what both of them refuse to refer to as the Creativity Workshop). Krall seems to know things she couldn't possibly know, to sketch things which haven't happened. She talks of a terrible tempest, draws a white figure diving off a cliff; days later Rio is razed by an unanticipated hurricane and Christ the Redeemer plunges to its destruction. Is Krall merely delusional? Or can she really foresee the future? Or is she not just predicting the future but actually causing it? Is she even—as her preacher father believes—possessed? These questions give us the basic plot for the first half of the novel. If Atwood is alighting magpie-like on ideas that appeal to her then Jensen is plugging much more straightforwardly into a familiar faith versus reason debate. Unfortunately, like Atwood, she is unable to ally acute characterisation to anything approaching a satisfying story. Fox, like Toby, is good company, although not necessarily in the traditional sense. I imagine Jensen must have had fun writing her because there must be something liberating about getting inside a character who is quite so scathing. Not only is her internal monologue is continually scathing of those around her but it is even more so when directed at herself; any drop of self-pity is almost immediately vapourised. "Self-analysis is a bad habit I indulge in regularly, under the guise of 'working on myself'" (p. 45). When this analysis is applied to Krall she more than meets her match since her patient has no need to button down her anger under middle class propriety. These encounters show that Fox is more vulnerable than she would like to believe. Although the clash of faith and science gives the novel its drive, we are never told how this clash might apply to Krall. If she can predict the future, then how? It is perhaps understandable that Jensen ignores this since there is no possible satisfactory answer to the question. At the same time, it is a shame she simply abandons it in favour of fireworks. After a brief middle act in which Fox is estranged from the other characters, they are all reunited in an unlikely international conspiracy of dissident scientists. They then embark on a long final sprint in which the characters attempt to outpace Armageddon and the reader attempts to keep pace with the characters. 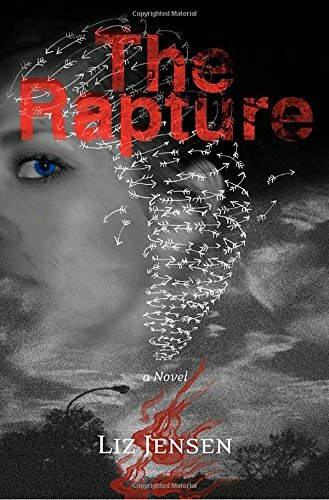 This is the most conventional part of The Rapture , where it becomes something approaching a standard disaster thriller. All the dominos are in place and now they must topple and, of course, the scientists need a final showdown with the representatives of Faith. The fact that this climax takes place at the Olympic Stadium in Stratford, East London again shows a preference for big, obvious symbols which is at odds with the more intricate intimacies of the rest of the book. The book is most interesting when Fox just wants to save Krall, not the world. In keeping with the themes of her novel, Jensen has created a memorably biblical means of bringing about this new world. I don't know about you but, when it comes to the end of the world, I hold with those who favour fire. Jensen actually gives us both fire and ice and has created a truly stunning final image, particularly in contrast to Atwood's bloodless Waterless Flood. It is the sort of image that Roland Emmerich—who recently toppled Christ the Redeemer himself in 2012 —would kill for. Both Atwood and Jensen have form, but there are far more similarities between The Year of the Flood and The Rapture than I was expecting. This review was predicated on the simple coincidence of Bloomsbury publishing two works of literary science fiction at around the same time. Inevitably the novels were concerned with dystopian and apocalyptic themes, the bread and butter of non-genre SF, but their concerns within these broad subgenres are shared and Jensen is obviously influenced by Atwood. Neither author seems quite sure what to do with their concerns, though, and this tarnishes the notable achievements of their books. In the end, The Rapture is the more successful because of the purity of its tone; there are none of the mad digressions of The Year of the Flood . I expected more of Margaret Atwood because she is so obviously capable of it. I will now expect the same of Liz Jensen, and I am especially interested to see whether they will both return once more to the possibilities offered by science fiction.